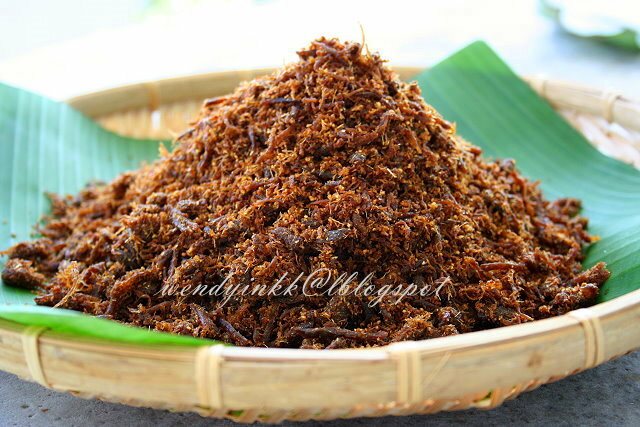 Beef serunding or beef floss is a Kelantan specialty. 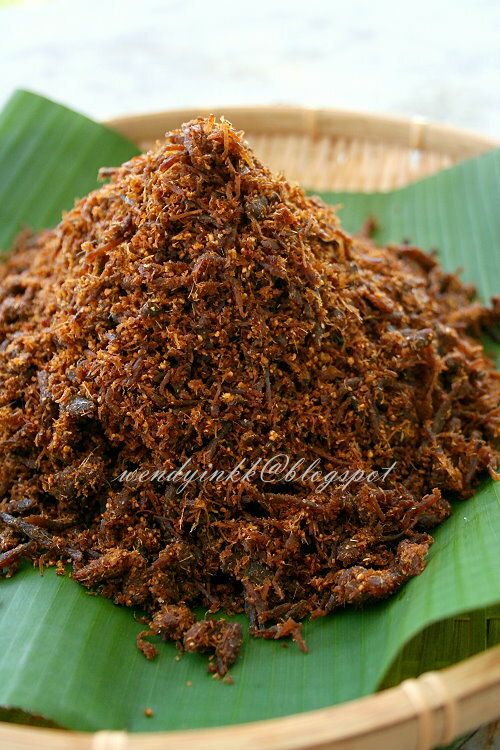 Some also call it as beef sambal or sambal daging in the Malay language. It is said that a properly made serunding can be kept for a year without referigeration. I was itching to try making this, but was hesitating and hesitating and hesitating. Finally I did, just last week! LOL. I can't stop thinking about all these Kelantanese delights because they all reminded me of my lovely holiday there many years ago. I did buy some beef floss in Kelantan before, but I don't quite remember the taste. This recipe is said to come from the famous Kampung Orang Laut, Kelantan, which translates as the Sea People village. I adapted the recipe slightly for 1/4 of the original and regretted I used a lower ratio of fennel. Frankly I am not big fan of coriander seeds, especially when it's the dominant spice flavour. Just a personal preference thingy. I also pressed my beef using the mortar and pestle because I didn't floss them enough initially. It was hard to get them really fine with just the wok's spatula, unless I boiled the beef for 4 hours, and that will render the beef tasteless. Something I don't want to do. 4. Heat a wok/pan on medium heat and put in 1/4 cup of oil. Saute the paste until fragrant. Turn heat to low. Add in the dry spices and saute until it smells really good. Add in coconut milk and let it cook until it exudes oil. Add in kerisik and cook everything until it looks almost dry. 5. 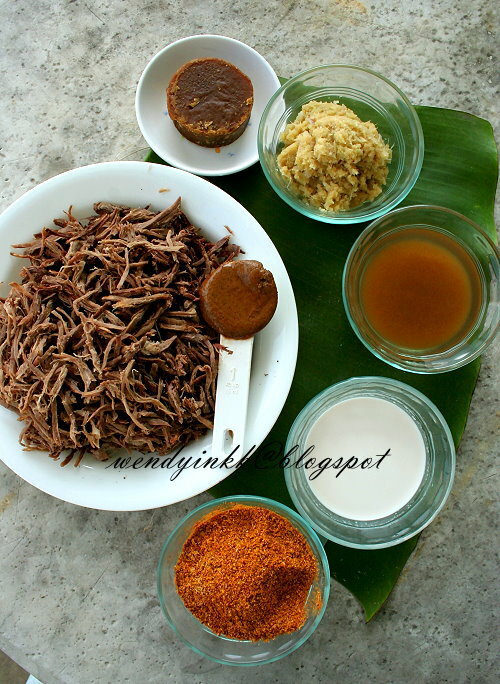 Put in tamarind juice and palm sugar and cook until the sugar is melted. add salt. 6. With medium low heat, Add in beef floss and toss everything around to prevent burning. As you move the beef around press it with the spatula to flatten the beef floss. 7. Cook the beef serunding until it feels dry to touch. *Use a pestle to help further 'floss' the beef in the wok by pressing and twisiting. Or you can transfer the floss to a mortar and press with the pestle. Mmmm...very fragrant and flavourful. This is very nice as sandwich filling. nampak seperti Sambal Daging yang di jual atas pasar Siti Khadijah hehe. This seruding daging must be very flavorful. I bet it is very yummy to go with porridge too! Serunding daging , serunding ayam dan serunding ikan sekarang ni dah makin popular. bukan ajer orang kelantan yang minat tapi sekarang semua warga malaysia dan ader juga rakyat asing / pelancong yang dah mula suka dengan rasa serunding. Sebab rasa serunding memang best !